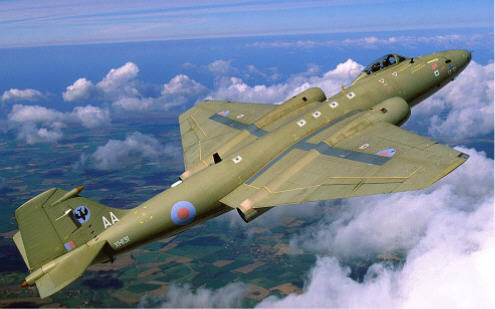 On this day in 1948, the English Electric Canberra made its first flight. The Canberra was a British light bomber that was manufactured in large numbers throughout the 1950’s. It was able to fly higher than any other bomber and set a world altitude record in 1957 of 70,301 feet. Due to its ability to avoide early jet interceptors and its significant performance improvements over contemporary piston-driven bombers the Canberra was a popular export and served not only with the Royal Air Force but also the Indian Air Force, Peruvian Air Force and Royal Australian Air Force. A variant for the USAF was also manufactured under license by the Glenn L. Martin company and was known as the Martin B-57 Canberra. 949 aircraft were built over the course of its production run (900 in the UK, 49 in Australia) and served with the Royal Air Force until 2006.